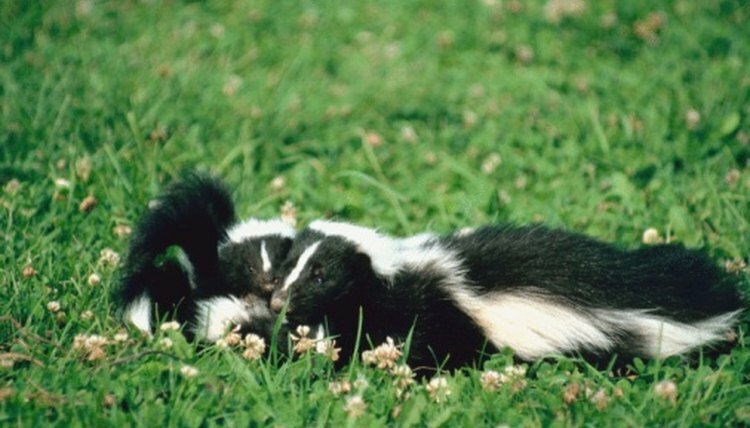 Finding a dead skunk in your yard can be an alarming, and smelly, experience. When this happens, it is important to remove and discard the dead skunk as soon as possible, before other animals become attracted to its scent and arrive in your yard in search of food. Proper handling of the dead skunk is crucial in keeping yourself safe and healthy. Put on thick gloves. Never use your bare hands to handle a dead skunk. Skunks carry rabies, and according to the New York Department of Environmental Conservation, you can become infected from a rabid skunk if the skunk's saliva comes into contact with an open wound or your eyes, nose or mouth. Pick up the dead skunk from the ground. A shovel is an effective tool for scooping the skunk off the ground. Even if you wear gloves, it is still best to not touch the skunk because you do not know what kinds of bacteria it carries. Empty the skunk into a garbage bag. Tie the garbage bag tight so that the skunk is sealed well inside. Transport the garbage bag to a dumpster or landfill to discard the skunk. Leaving the skunk on your property in the garbage will continue to produce a foul odor, so it is a good idea to take the skunk elsewhere. Always wash your hands with antibacterial soap and warm water after handling animals that are alive or dead.